Send four people out of the room and bring them in one at a time. The first person comes in and is told that one person has been told to "moo" louder than everyone else. Everyone moos at the count of three. The person has to guess who it is. 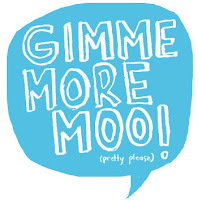 Have everyone moo again (second chance), then tell them who it is (anybody) and ask them to be the one to moo loudest for the next person. When the next person comes in and listens, on the second moo, nobody else moos except the first person. Do this again for the third, and use the second person to moo, etc. Explain this to everyone before the first person comes in.